You are here:Home » Blog » Byron Bay Activities » Which Of These Byron Bay Holiday Activities Will You Try First? 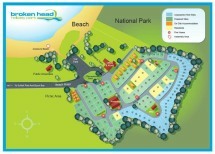 A Byron Bay camping holiday at Broken Head Holiday Park is always going to be fun. You’ll be in the great outdoors, beside sea and sand and surrounded by tropical flora and fauna. But, for many holidaymakers (and families with young children in particular) you’ll need a lot more than an impressive landscape to keep everyone amused – regardless of how mesmerising it is. Luckily there are plenty of activities to amuse and entertain a range of age groups on a Byron Bay camping holiday. There’s beachcombing, surfing, trekking or visiting the nature reserves to see if you can spot some of Australia’s most endangered wildlife, for instance. Then again, you can go visiting the nearby towns with their unique, individual attractions and where you can spend hours shopping or golfing and later sampling some of the gorgeous home cooking in cafes and restaurants (you’ll find plenty of the latter dotted throughout Byron Bay incidentally). Here at Broken Head Holiday Park we always find plenty to do when not working, so we’ve put together a list of some our favourite past times. Always a favourite on a Byron Bay camping holiday seeing as there are so many semi-tropical rain forests and coastal paths to choose from, bush walking is probably one of the most popular past times for tourists and campers who book with us. And no wonder: there are actually a total of eight official Nature Reserves in the area to choose from – one of which is right on our doorstep here at Broken Head Holiday Park. Some of the trails actually combine both coastal walking and trekking though rain forest, giving you the chance to see stunning marine life such as humpback whales, dolphins and rays, as well as endangered frogs, koala bears and bush turkey – and all within the space of half a day. There’s actually a fascinating trail from Broken Head Holiday Park itself. This Byron Bay headland walk is named the Two Sisters Walking Track and is a involves a lovely trek through some amazingly colourful rainforest leading out onto rocky outcrops right on the headland at Kings Beach. Like most of the local walks it’s not long and doesn’t require a huge amount of fitness. Another must-do while Byron Bay camping is to watch the sunrise at the top of Mount Warning. This old volcano (don’t worry – it last erupted more than 20 million years ago), sits 1100 metres high and around an hour’s drive from the town of Byron Bay. There are boardwalks on the top with plenty of seating to picnic on and enjoy the views of the Tweed Valley for miles around. This popular stretch of sea and sand sits in front of the nearby town of Byron Bay and is excellent for basic surfing (actually there are a total of nine outstanding surfing beaches in the whole of Byron Bay camping region). The beach is actually reputed to be one of the most spectacular in the whole of Australia thanks to its beautiful blue waters and soft white sands. This is another beach which is patrolled during the summer months so another great spot for mums and dads. Kids – and parents too – should look out for The Sandman aka Steve Machell who can often be found sculpting amazing gothic castles or weird creatures from sand and water. Popular with families and longboarders alike. There are also barbecues here and which are ideal for a small beach party. Tallow Beach is the 15km stretch of wild coastland which comes past Broken Head Holiday Park and is known as the spot where the beach and the bush meet. Cosy Corner (so-called because it’s sheltered) is popular with surfers thanks to its impressive break and sits on the south side of Cape Byron. It’s not a great beach for swimming however, since there are riptides. TIP: Dogs are very welcome on Tallow Beach. These three coves form part of the Broken Head Nature Reserve. Kings Beach, Bray Beach and Whites Beach can easily be accessed via the headland from the Holiday Park. Swimming here is possible but only on days when the sea is calm and there are plenty of rocks. Heading towards Lennox Head, Seven Mile Beach is vast, quiet and good for catching sight of galloping horses (there are horse riding tours available). Nearby, Lake Ainsworth is a freshwater tea-tree lake you can go boating in and picnicking at nearby (sand-free sandwiches; what bliss) under the Paperbark trees. Dogs are allowed on part of this beach but only between the low and high water marks for 400 metres. Reputed to be one of the most beautiful spots in the world thanks to the tropical blue Pacific waters, rugged coastland and lush green semi-tropical rain forests, Cape Byron provides an amazing landscape for photographers. But it’s not only landscape photographers who love coming here. Wildlife and sea life are also in abundance and there are plenty of advantage points from which to photograph your particular subject. Then there’s the weather – it’s nearly always guaranteed to be sunny and bright so even if you don’t spot what you’re looking for, you’ll still have a relaxing time in stunning surrounds on your Byron Bay camping holiday. There is no swimming pool at Broken Head Holiday Park (there doesn’t need to be really seeing as we have the Pacific Ocean right on our doorstep), however behind our Beach Shacks you’ll find a large park which has a playground for the kids, and it’s also a great place to have an all-ages family picnic if you’re on a Byron Bay camping holiday with grandparents. Standing 22 metres tall and sitting an impressive 94 metres above sea level (on a sheer drop), the century-old Cape Byron Lighthouse is an iconic attraction for the area. Maintained by the Australian maritime Safety Authority, the lighthouse boats a 1000 watt tungsten-halogen lamp which flashes every 15 seconds and can be seen up to 27 nautical miles away (that’s because the beam is actually equivalent to more than two million candles). The actual opening of the lighthouse in Byron Bay in November 1901 was a huge event which drew crowds from Lismore and Murwillumbah (thanks to special trains laid on for the occasion). Even the Australian Premier at the time, the Hon John See, came to visit. You can walk or cycling there from our Byron Bay camping ground, it’s a four km round trip. You won’t regret the views (if you’re interested in watching whales in Byron Bay the season stretches from July to October), and there’s a café at the actual lighthouse selling ice cream and teas. The Aboriginal Arakwal clan are the custodians of the whole of the Byron Bay area and, as such, they are determined to continue with and preserve traditional sites and culture. The Arakwal Bumberlin people have been recorded as living in the Byron Bay area for more than 22,000 years. In fact there were more than 500 Aboriginal tribes living in Australia prior to Captain Cook landing and introducing a European lifestyle. The town of Byron Bay itself is known in Aboriginal tongue as Cavenbah. The Arakwal are custodians of land and sea in the Byron Bay area thanks to the Indigenous Land Use Agreements signed on behalf of the Arakwal people and the New South Wales Government. Whether its artisan crafts, organic clothing, luxury goods or wholefoods you’re looking for then you’ll definitely find them in Byron Bay. The main shopping areas are Jonson Street (where you’ll also find the town’s community centre), the Lawson and Fletcher Street block and the Arts and Industry Park. The latter, which sits around 4km from the town centre, is the base for a whole selection of artists and creative types. Most of the shops are independents rather than chain stores which means that whatever you buy here in Byron Bay will tend to be a one-off – or at least not something you can easily pick up in Sydney, Adelaide or any of the other big cities. Surfing isn’t the only popular sporting activity on a Byron Bay camping holiday. You can also hang-glide, go horse riding, mountain biking, rock climbing and sea kayaking… lots to choose from in other words. Sitting just a seven minute drive away from Broken Head Holiday Park, the town of Byron Bay – named by Captain James Cook after the poet Lord Byron’s circumnavigator grandfather – acts as a beacon to thousands of tourists on an annual basis. And there’s a reason for that. The beautiful Main Beach at Byron and the happy, carefree and ‘alternative’ ethos which has never really left the town since it became a fun-loving, hippy holiday hang-out in the early 1970s, for one (also it’s definitely tinged with an element of sophistication these days). Another is the subtropical rainforests nearby, such as Nightcap National Park and Minyon Falls (the latter being another excellent tourist trail). The water at the beach is good for surfing while scuba diving and snorkelling are also popular past times at the town. Those whose interests are more culinary focused will love browsing through the 70-odd stalls at the famers’ market at the Butler Street Reserve on Thursdays. A craft market meanwhile takes place at the same spot on the first Sunday of the month. Railway Park plays host to an artisan market every Saturday evening. Bangalow, Newrybar and Coopers Shoot are all towns within easy reach of Byron Bay (around 15 minutes). Then there is Nimbin – one of the more colourful of the hippy destinations of the 70s thanks to its famous communes at the time. Further on from Nimbin, at Lillian Rock the Blue Knob Markets are worth experiencing on Saturdays for homemade and organic treats during your Byron Bay camping holiday. Julian Rocks is a marine reserve which sits 2.5km from the shore of Byron Bay. Named by Captain Cook in 1776, the reserve boasts more than 500 tropical and temperate fish. It’s also home to a number of seabirds. During the winter grey nurse sharks visit while in mid-summer leopard sharks can often be spotted. In autumn manta rays like to drop by. As well as sea life there are also plenty of beautifully coloured sponges and both hard and soft corals. All dives to the marine reserve are supervised and it’s reached via a boat. The water temperature heats up to 25 degrees Celsius and visibility is around 20 metres. Quaint with great views, and often referred to as Byron’s cooler cousin, Lennox Head boasts many charms, not least the small main street filled with cafes and restaurants selling simple homemade and delicious organic foods. Just a 25 mile drive north from Lennox Head, sits the lovely seaside town of Brunswick Head with its protected ocean lagoon and excellent water breaks for surfing. Nearby Mullumbimby has plenty of vintage stores and organic food outlets and cafes. So what do you think? We hope this helps with planning out your itinerary for your Byron Bay camping holiday. For further information on any of the above feel free to ask any of the staff at Broken Head Holiday Park.